Y’all should know that I love making wreaths. Plus I also enjoy sewing AND yard sale shopping for cool vintage finds. 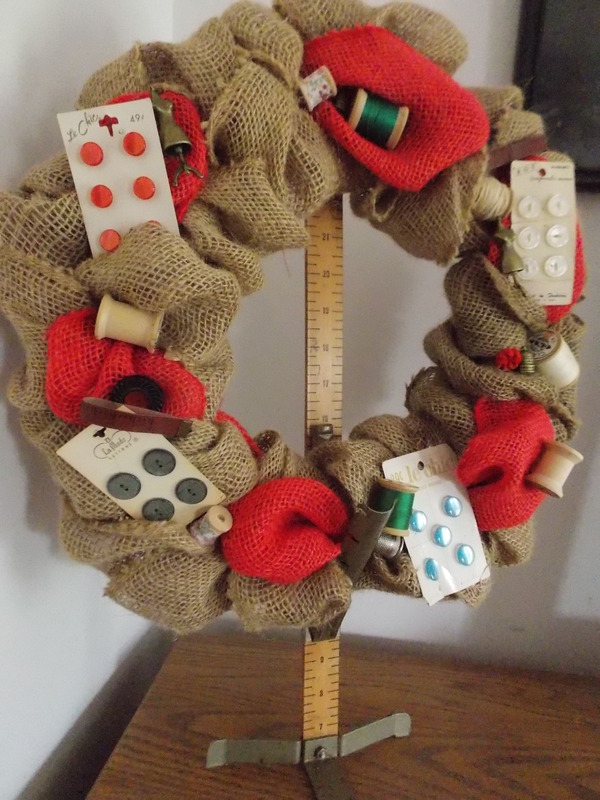 This wreath is a happy marriage of all those things put together! 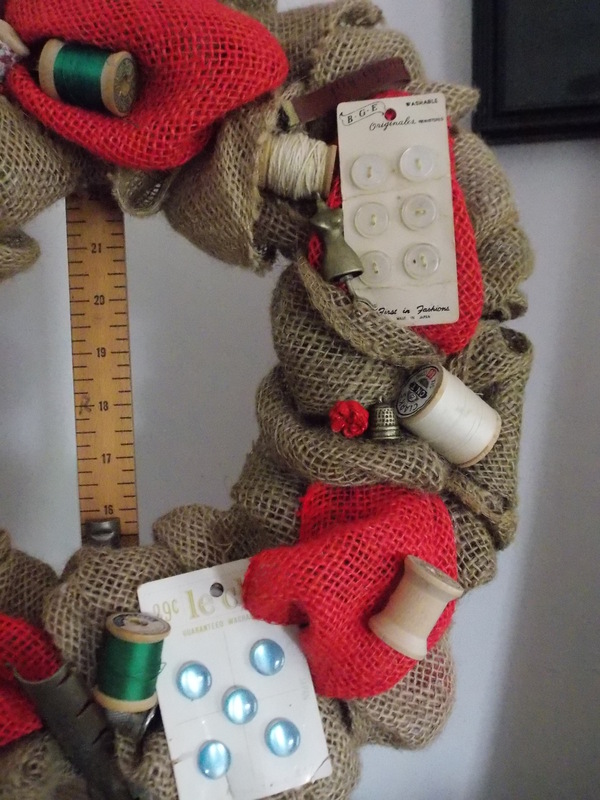 I took a wide burlap ribbon and threaded it onto a wire wreath frame. 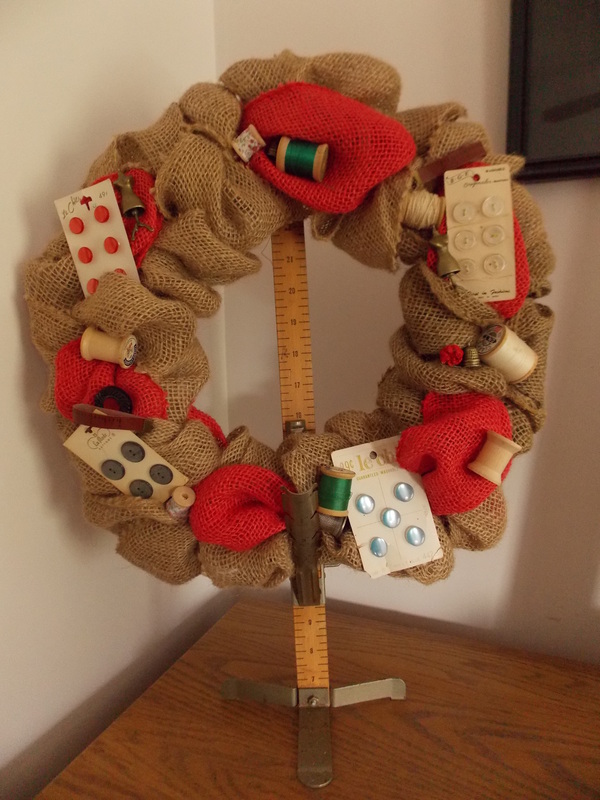 Then I added a touch of red burlap ribbon for a little color. Next came the fun part for me. 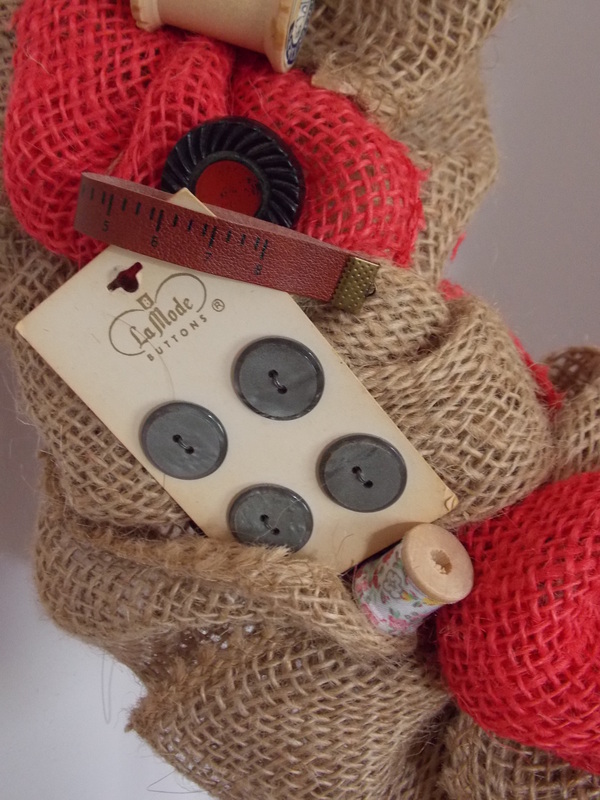 I added things like old button cards, thimbles, and sewing charms from a clearance item at Michael’s. Also, some wooden spools of thread, both empty and full. Most of these things came from yard sale box lots, even the cool stand that I have this displayed on. 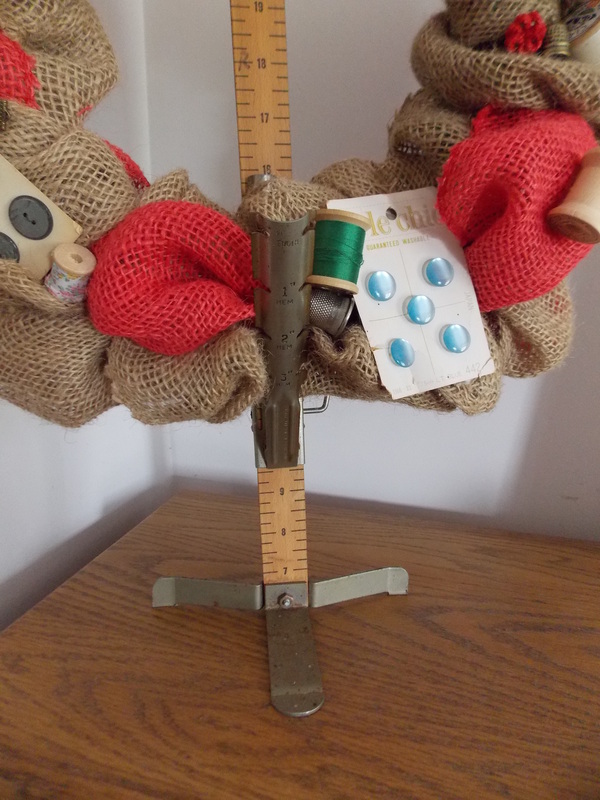 I have no idea what this is officially called, but it is a ruler on a tripod stand with an arm that tilts forward with hem lengths displayed on it. It is perfect for setting my wreath on. 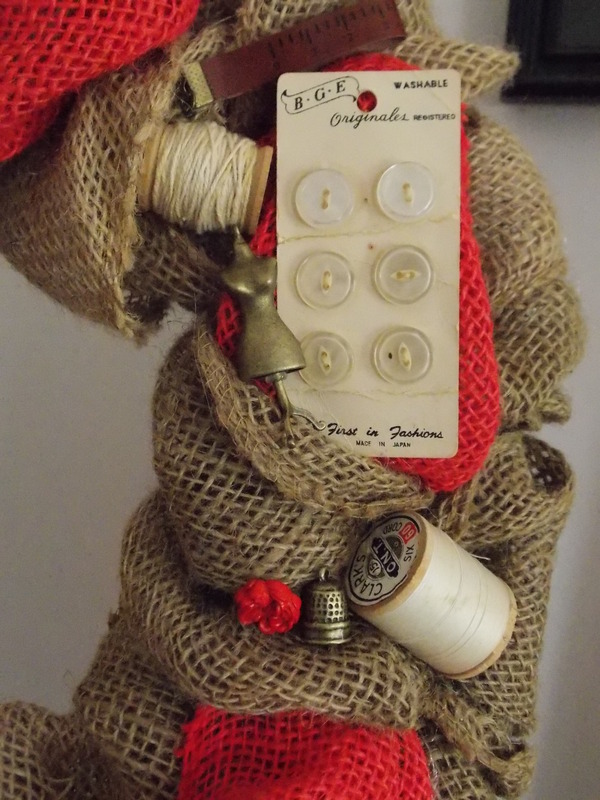 This was a creative way to use up and display some of those vintage sewing notions I’d accumulated. All in all, this is different than any other wreath I’ve ever made, but I personally love it! Since I haven’t been on here all that much, I figured I’d give a little peek into what we’ve been up to these days. For the last few years the April to mid-June time is always heaped full of extra activities. It seems as if every field trip, campout, concert, and various other things are squeezed into that time when the weather is getting nicer and before school ends. 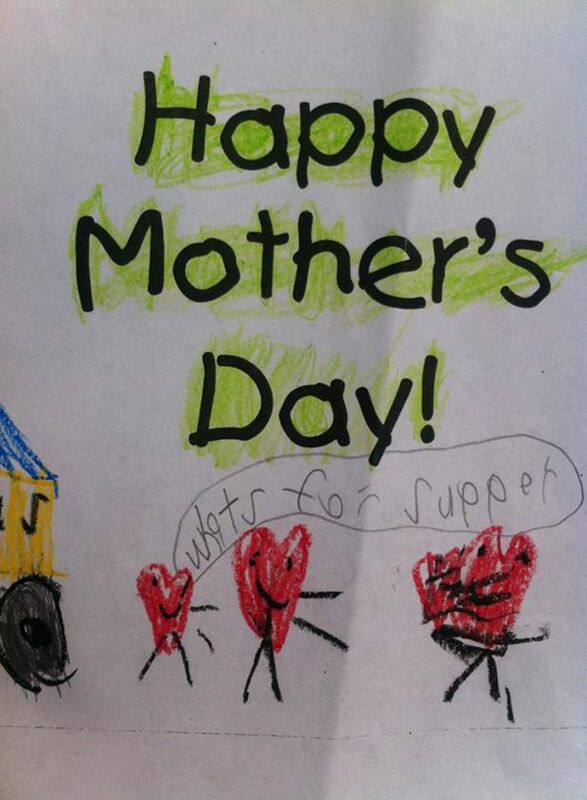 Oh yeah, and our family has a boatload of spring birthdays tucked in there as well as Easter and Mother’s Day. One of my many joys has been to lead a women’s Bible study at our church. 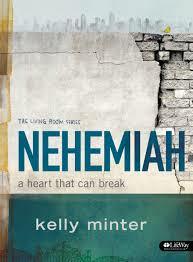 I very much felt led to do a study on Nehemiah by Kelly Minter. It is a GREAT study that I would highly recommend! I could do a whole big blog post just on what I learned through this series. One week I finally decided to paint my kitchen this pretty blue. I had had the same light green for something like ten years and was ready for a change. I really love it. The antique embroidery is something I found in a thrift store within a broken frame. I placed it in a newer frame and it looks pretty good with the blue walls. To update my newly painted kitchen I sewed up a new valance and a set of burlap panels with red and white gingham accents and ruffles. This photo is when I was getting some final touches ready to sew on. You can see the pins if you look closely. 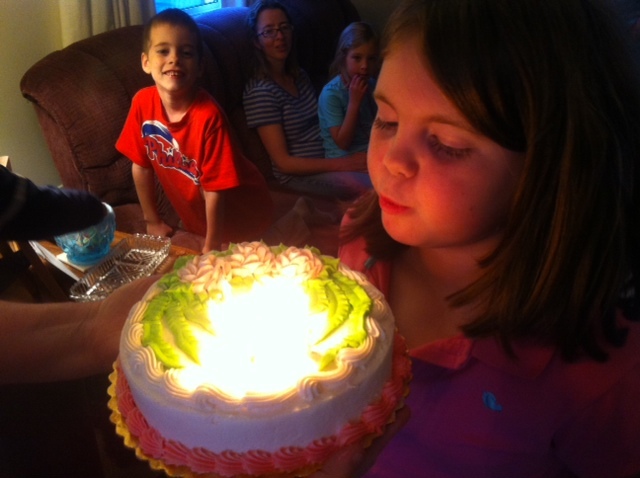 This is a precious picture from one of my kids’ birthdays. I have the privilege of having my daughter’s birthday the day right after mine. It is fun to celebrate them together every year! 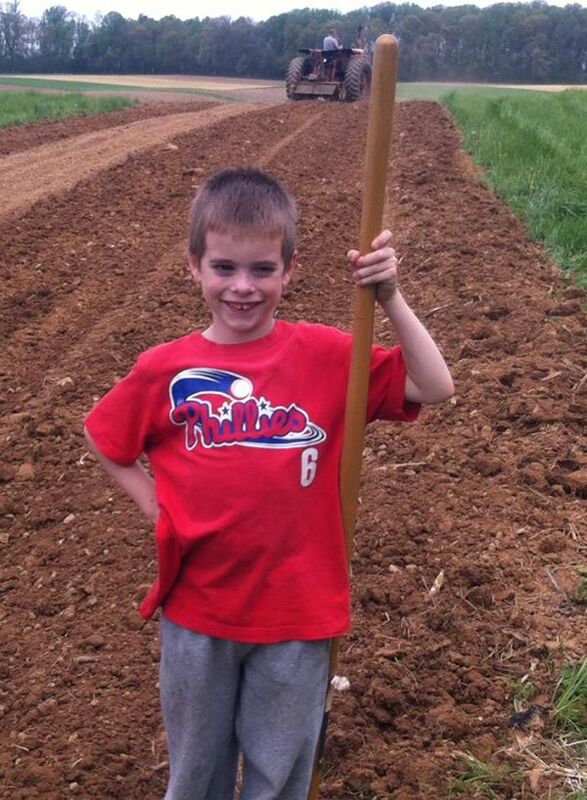 Due to wacky weather, our garden planting was very late this year as opposed to other years. We didn’t even bother planting peas as it got too late. 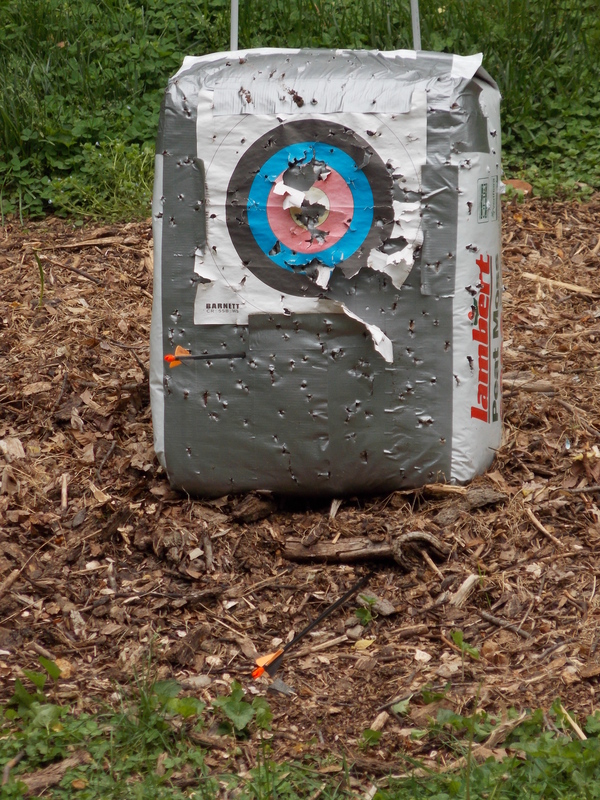 My oldest has a new found love for archery, so we we set up a target shooting area in the backyard. He loves to practice shooting when he gets home from school, which is an hour earlier than my elementary kids. 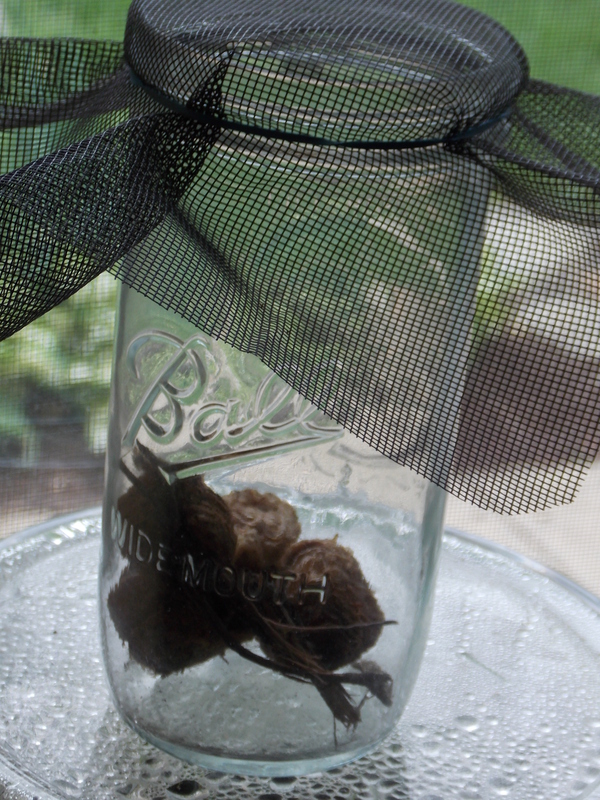 Let’s say a prayer that the screen top of this jar does NOT come off. If it does and these egg sacs decide to burst forth with 1,000’s of baby praying mantises, we are in deep trouble. These pods were all found last fall and kept in a jar in our garage all winter. We are waiting for them to hatch soon! Last but certainly not least, it is refreshing to see my green grass and flowerbeds filled with color once again. 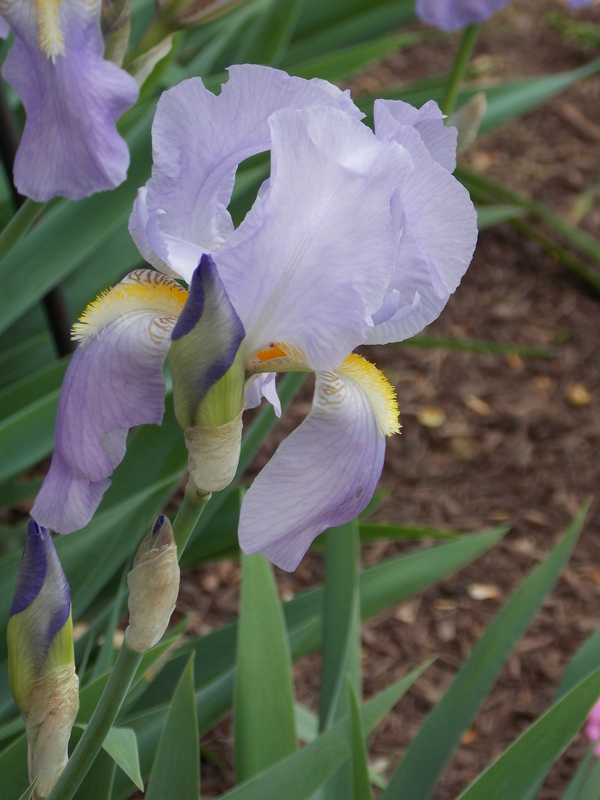 I have lots and lots of purple irises and they are finally blooming. It is beautiful. 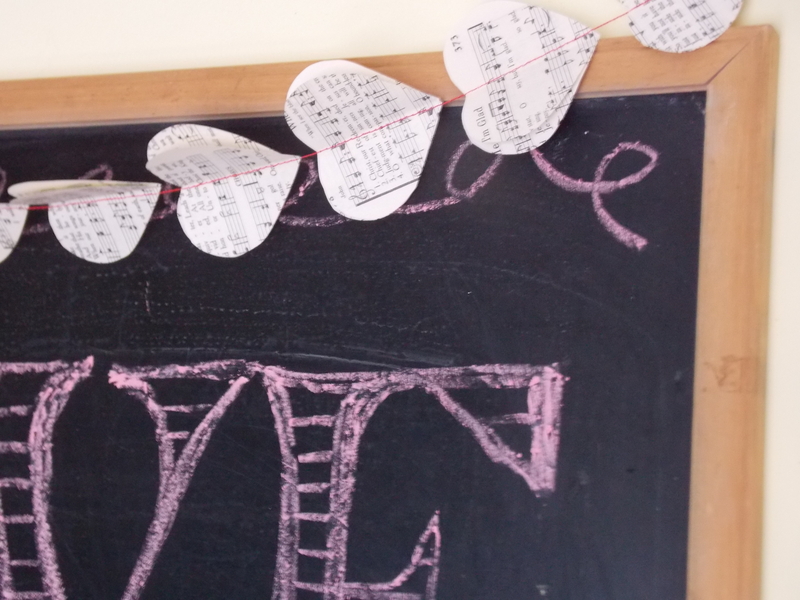 On tap for today is a pretty paper garland, perfect for Valentine’s Day. 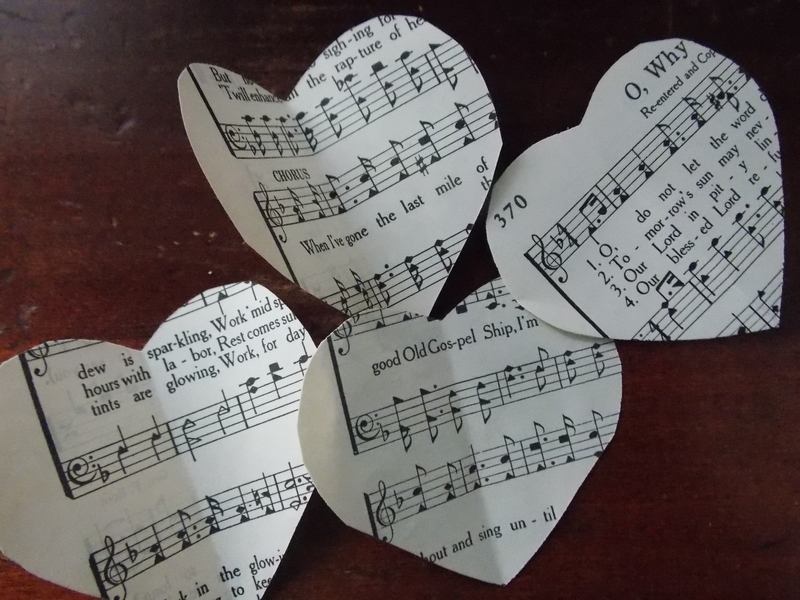 These are pretty quick to whip up–all you need is an old book or hymnal, scissors, and a sewing machine. 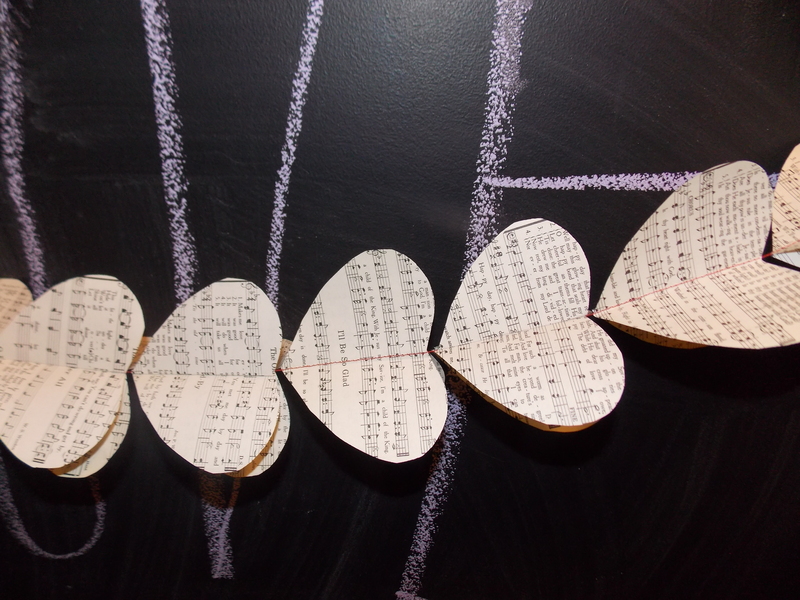 Cut out a bunch of hearts that are the same size. I used a few pieces of paper stacked together and was able to cut out quite a few in a short time. 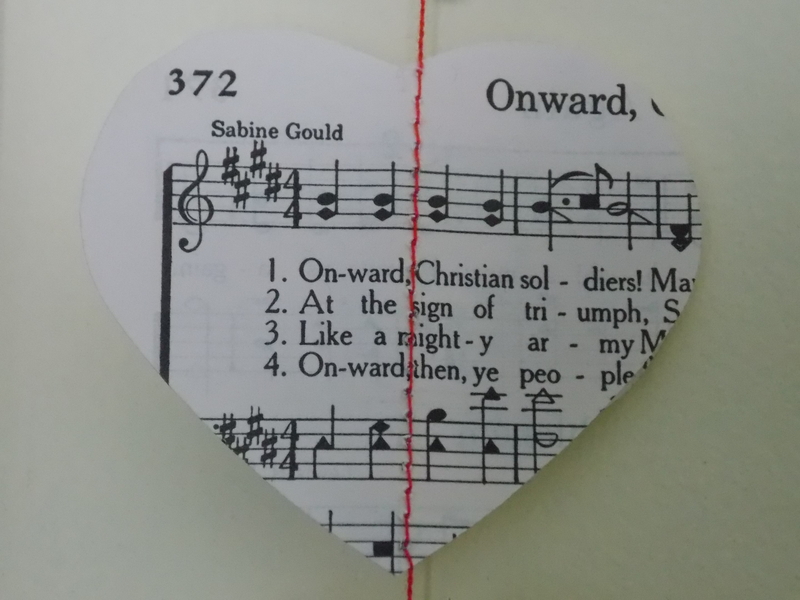 After cutting out gobs of these, all you have to do is sew two at a time together (as you can see, I used red thread) down the middle of the heart. Keep adding sets of two as you go. You an either make all of them flush against each other or stagger them out, leaving an inch or two of thread in between the sets of hearts. At this point I’ll also add that I made a nice length of thread at the beginning and end of each garland for hanging purposes. 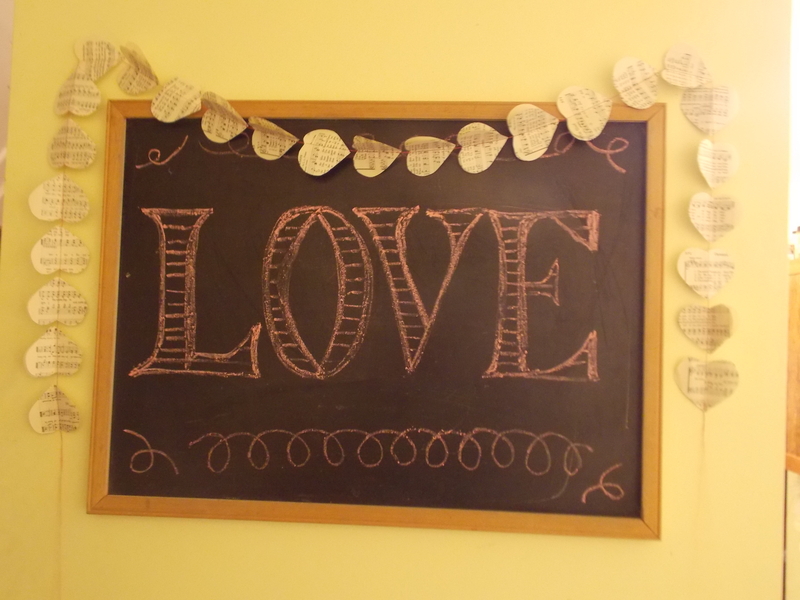 When finished, you can either let the hearts hang as is or fold each in half, creating a 3-dimensional look. After hanging this up and taking pics, I realized this would look MUCH better against a darker wall. Oh well. I also thought about combining this music paper with red cardstock and alternating them. By the way, do ya like my chalkboard? 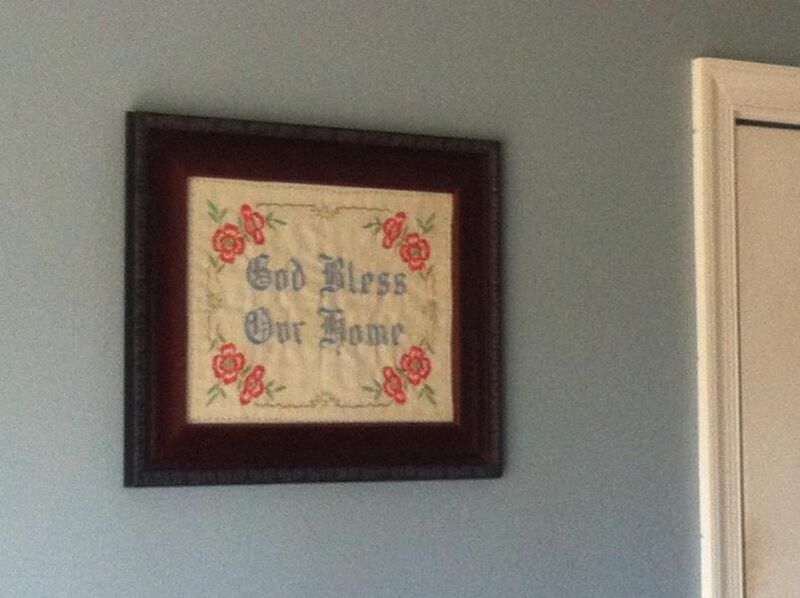 This is hanging in our entryway and was a 5 cent yard sale steal. I usually have a verse written on it, but decided to do “LOVE” in a font that I liked. 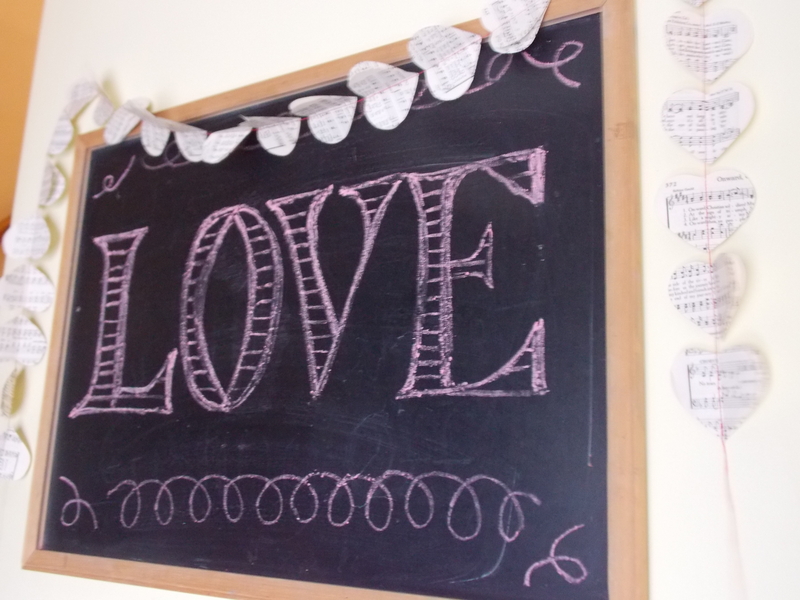 I looked some fonts up, saw how LOVE looked written in this particular one, then copied it freehand in pink chalk. Anybody else have cold hands? I’ve almost always had cold hands (and feet!) and I’m sure they’re about to get colder here soon. 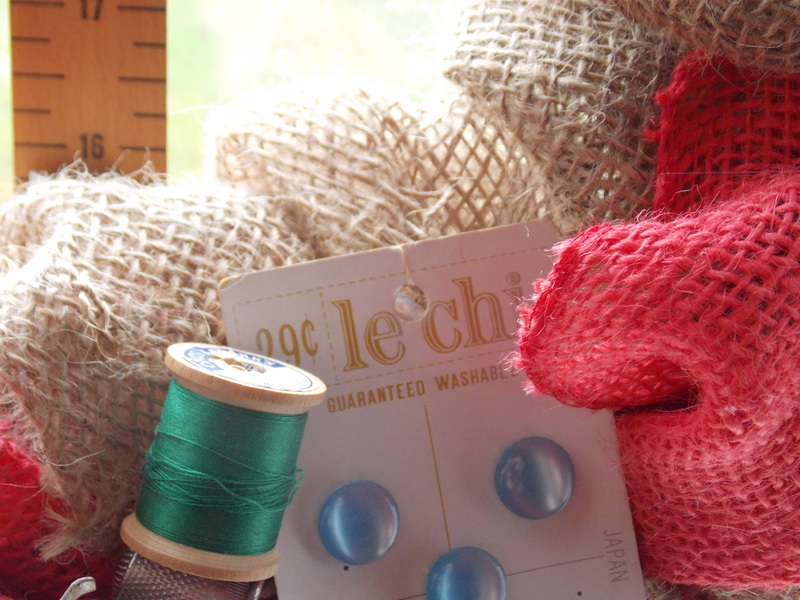 The project I’m sharing today is perfect for using on a blustery cold day. That is, if you venture out at all in it. Here in PA the temps are dropping 50 degrees in the span of one day. It’s been a really crazy sort of winter for a lot of folks, and spring is still a long way off it seems. Hopefully something like these can help to warm you up. 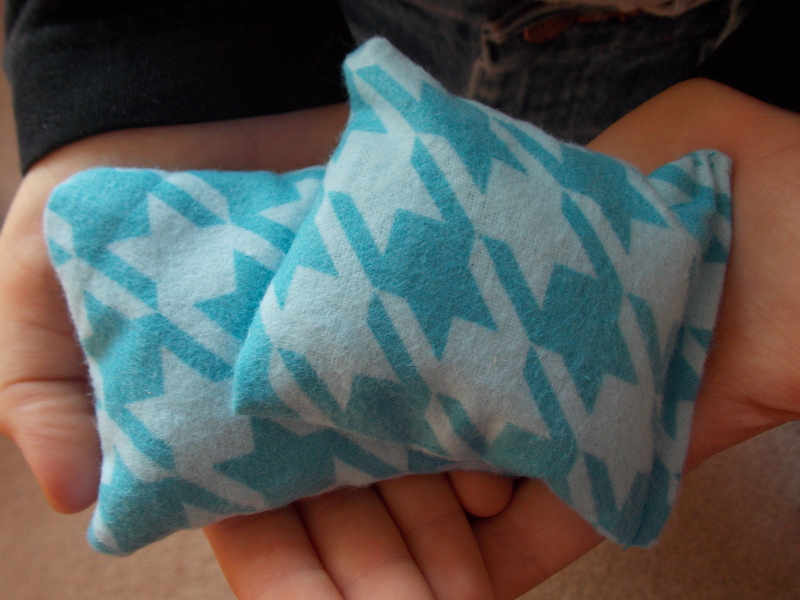 Homemade hand warmers, perfect for tucking into pockets before heading out in the cold. Easy to make, and easier to heat up–just pop them in the microwave! 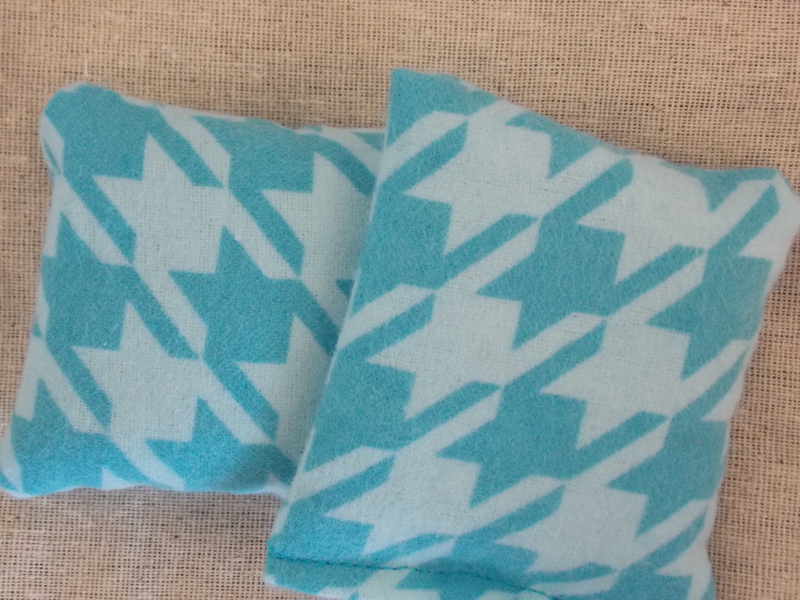 Mine are made of a cozy flannel in this cute blue houndstooth print. These would be a good project for beginning sewers or someone who likes a quick little project. 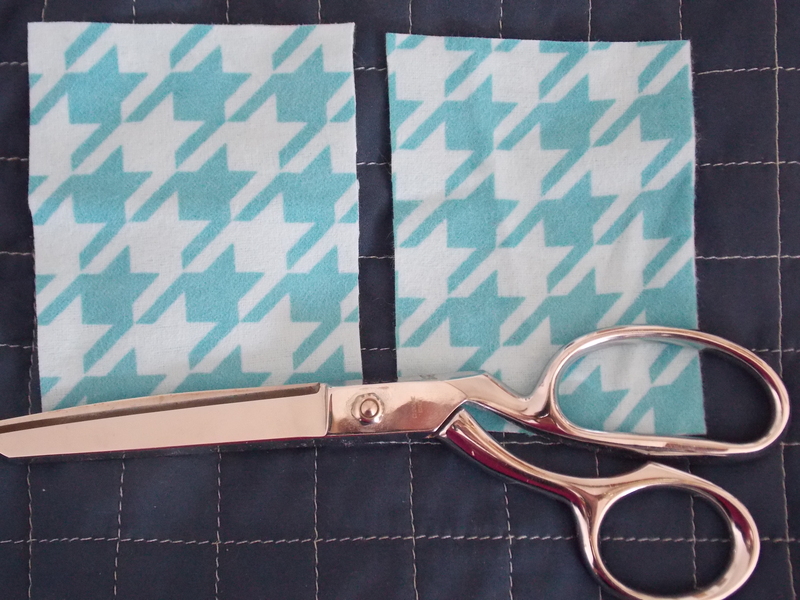 To make these, cut fabric into squares (mine are about 4″ by 4″). You will need 2 squares for each warmer. 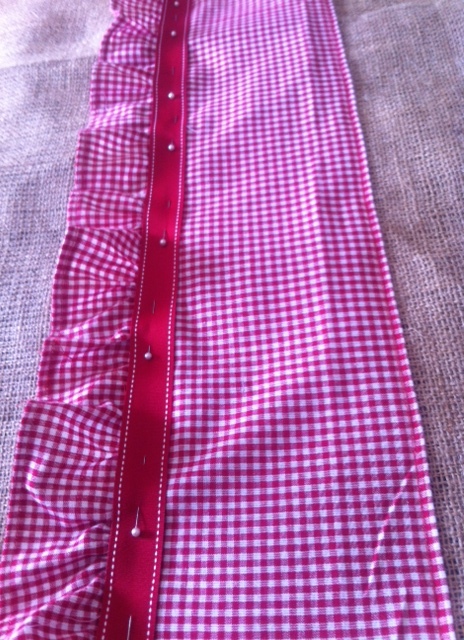 With right sides together, sew or serge along 3 of the sides, leaving that 4th side open. It should now look like a pocket. Tuck the raw edges in and hand-sew or carefully machine sew that last side closed, making sure you don’t lose that rice inside. That’s all. See? Quick and easy. 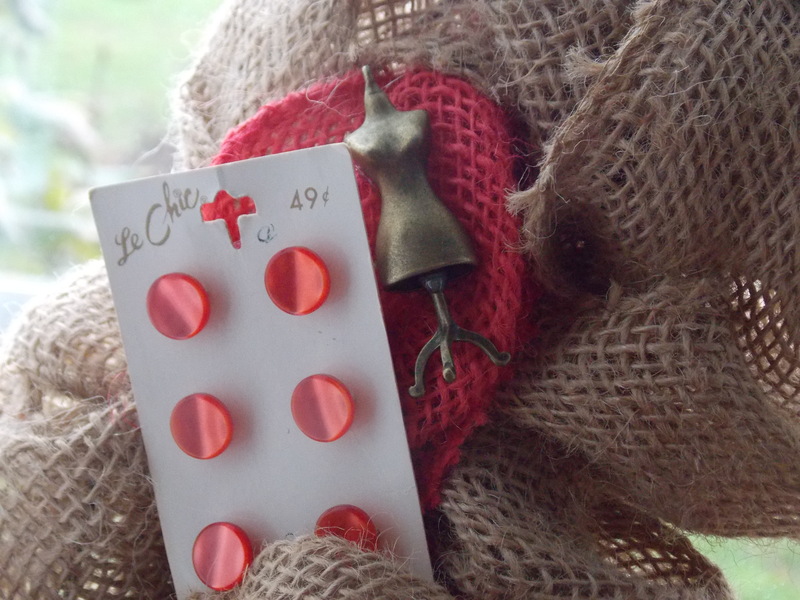 I haven’t tried it yet, but these would be cute done in heart shapes–perhaps a Valentine gift? As I mentioned previously, pop these babies in the microwave to heat them up and they should stay warm for awhile. 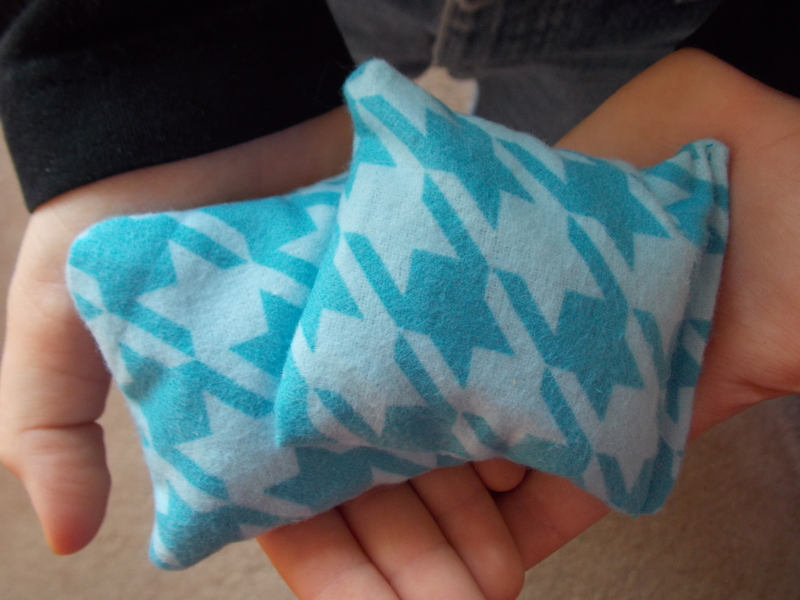 I did make a large, rectangular version of these as a heating pad and it works great. I have never been one for making big New Year’s Resolutions. Sure, I’ve had some here and there, and I would stick with them for awhile. However, I tend to think that by declaring some grand resolution that is far out of reach, it sets one up for failure. I also tend to be the hardest on my own self if I fail at something. Therefore, this year I just have a handful of small things that I would like to strive for. Some are serious and some may seem silly, but this is what comes to mind for me. 1. Learn at least one new skill. You’re never too old to learn something new! Some things I’ve taught myself in my thirties so far: how to sew, knit, crochet, blog, make good bread….I’d like to continue adding on to this list! 2. “Eat the frog.” If you’ve never heard this expression before, it comes from Mark Twain. He was expressing that you need to do something that seems difficult or that you’re intentionally putting off first, then do the things that are easier for you after that. I have a habit of procrastinating on the things I really am not looking forward to. Anyone else with me on that one?? Maybe this will be a kick in the pants to do those things first (basically, get it over with!) before tackling what I enjoy doing. 3. Make more things from scratch. Yeah, you may already think I’m a little over the top with this already. However, there’s a lot more things I could make on my own if I really tried. 4. Memorize 3 new passages from scripture. Someone really needs to light a fire under me on this one! I think scripture memorization is important and I am convinced that we need to have the Word of God written on our hearts and ready on our lips even more than ever. Our current times are SO stinking troubling that it about scares me. We Christians need to be ready to speak God’s Truth for all those times we feel Satan’s arrows being unleashed. Our kids need to learn this too. 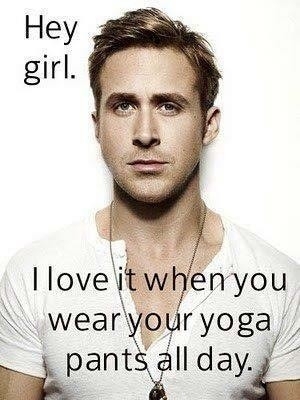 Also, for the record, this is not my husband. Just so you know. 6. Send more snail mail. Yes, you read that correctly. I used to be quite good at handwritten cards and notes of encouragement to people via the good ole’ postal service. Over the last few years I’ve slipped on this one, but I need to pick it back up. E-mails, Facebook postings, and texts just aren’t the same. 7. Drink more water and less coffee. Easier said than done. Well, I realize that’s a pretty short list. I’m sure I will add on to it as the days of 2014 progress, but I think it’s a good little start. Do you have any “small” resolutions that you want to tackle this year? 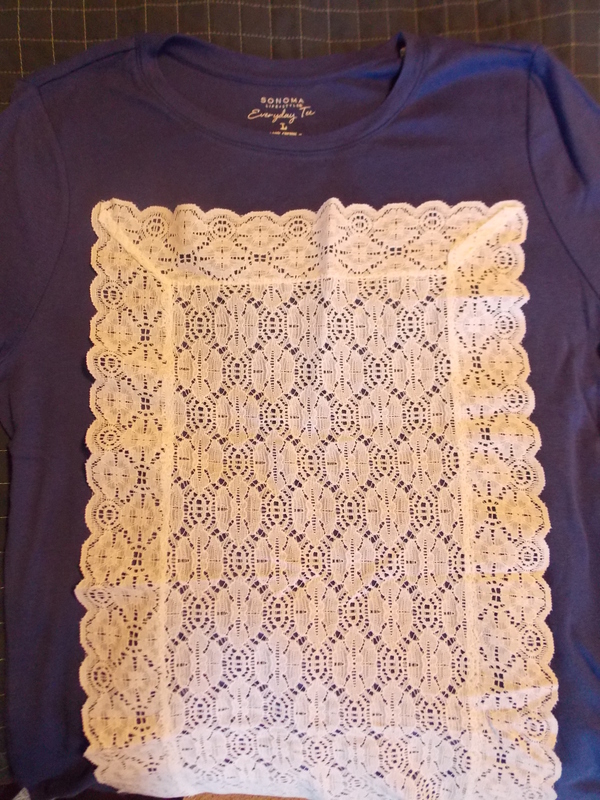 Upon seeing lots of cool lace inspired clothing lately, I decided to pretty up a basic long-sleeved T.
It was really pretty darn simple once I got cracking on it. 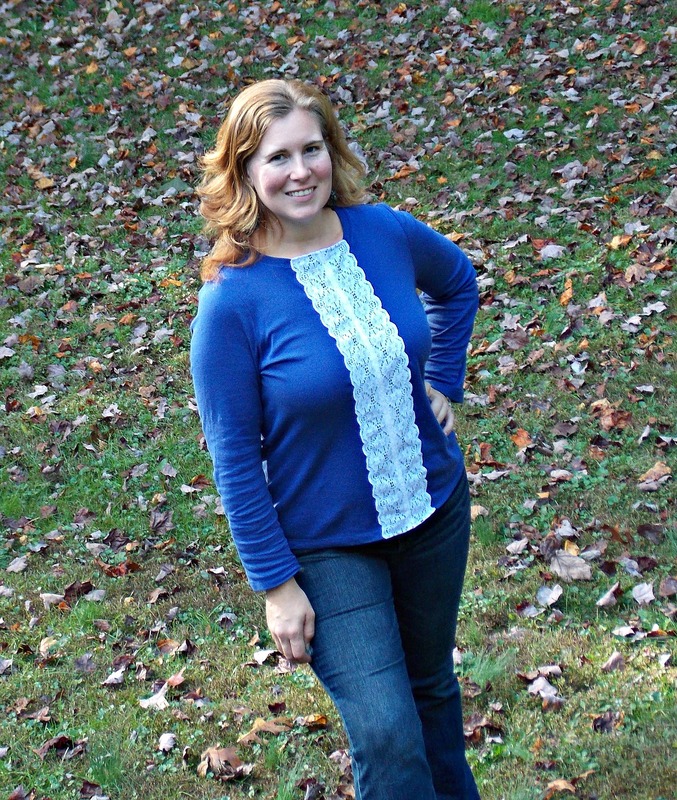 I started off with a basic knit t-shirt in this blue color. 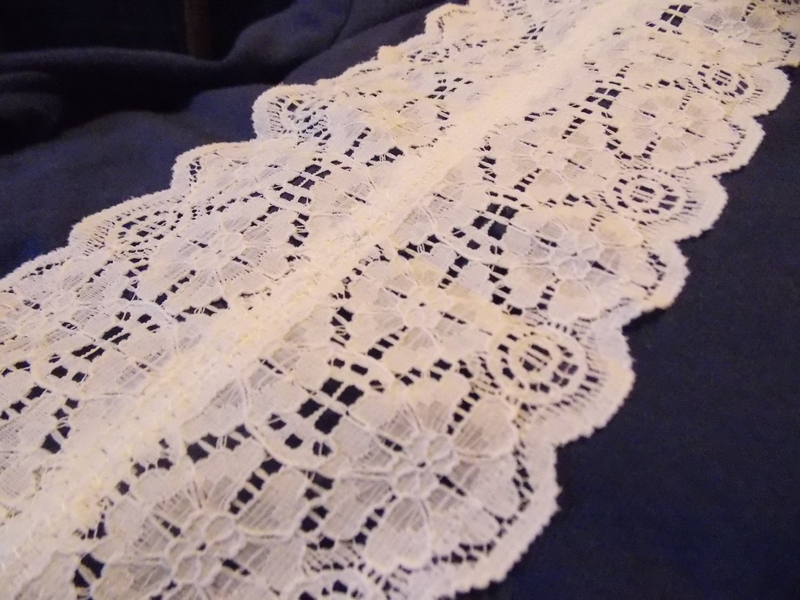 Since I’m a sucker for darker blue paired with white, I pulled out a Goodwill lace table runner thing that had been sitting in my fabric stash. After literally slicing off the longer end pieces off the runner, I pinned them down the middle of my tee, placing the straight sides so they touch. I also left a tail of about 1-2″ at the top and bottom, tucking them underneath into the inside of the shirt. If you do this or something similar, use lots of pins! After making sure everything was in its proper place, I zig-zag stitched down the middle using white thread. This adhered both pieces to the middle portion. 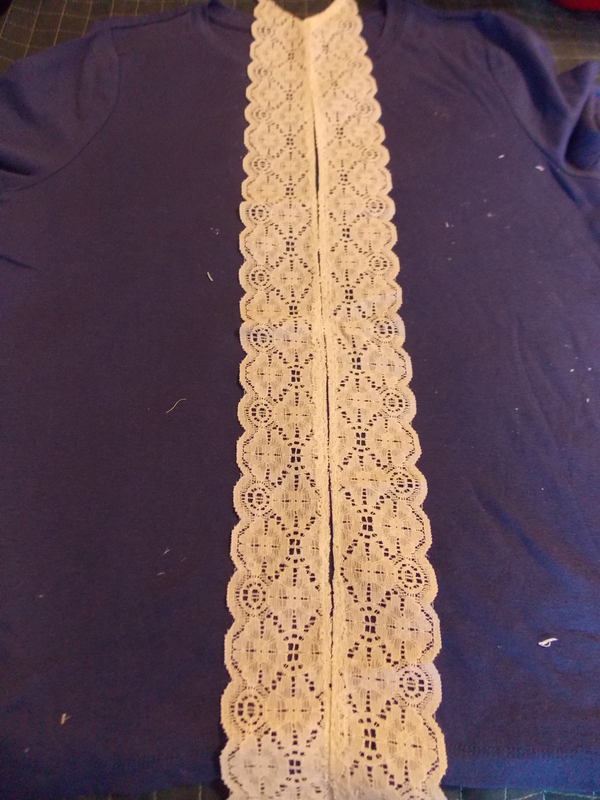 Following this I used a straight stitch down the side of each lace strip. I screwed up once and had to break out my trusty seam ripper to fix the situation. Another warning: knit material like this is sorta stretchy while the lace is not, so make you don’t have any bunchiness going on as you sew. That’s pretty much it. Now I have a new Tee to wear this fall and winter. The only thing I may change is the neckline–I don’t love how it looks just yet, so it may get fixed up a bit more, but I haven’t decided on how I want it. 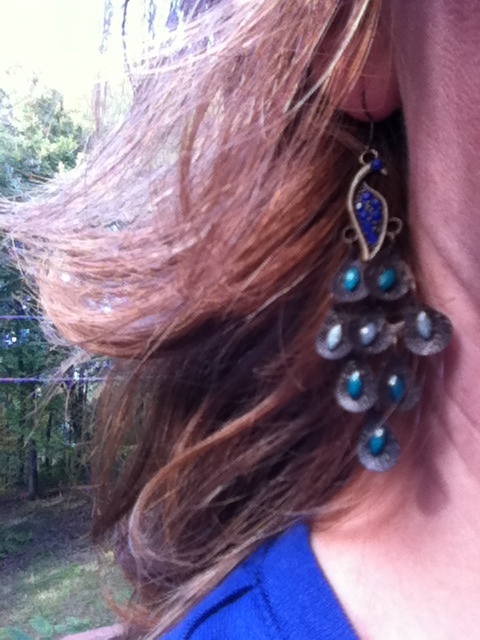 Paired up with my current favorite pair of earrings (which are a steal on amazon! 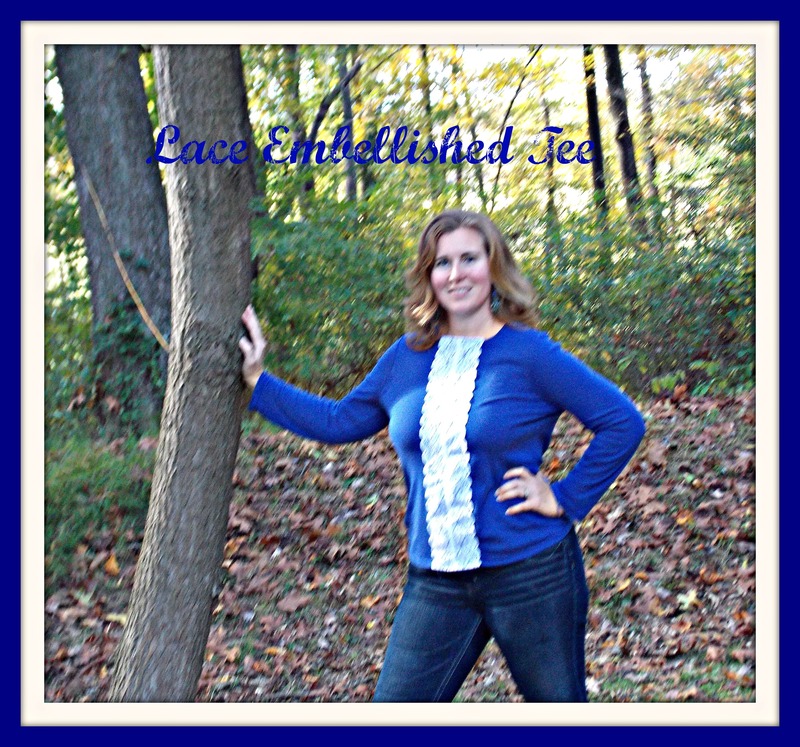 ), I really enjoyed wearing my new Tee to usher in some fall weather.